Or something along those lines. You’d be right, of course – it’s been months! Do you know why? It’s my typical reason for not getting around to posting about something for ages, and it’s because I love it so much! I use it at least once a day and I have two tubes on the go – one permanently in the top drawer of my desk and one next to the bed. Two of my nearest and dearest have been out and bought it and they love it too – it’s most definitely one of my top eye treatments. I started off testing the StriVectin-SD, which many of you will remember for the huge publicity drive when it was first released. Something along the lines of ‘better than Botox’ or similar, if I remember correctly. Because I wanted to test the cream around the eye area, though, StriVectin advised that I switch to the dedicated eye cream, as the other contains Peppermint Oil. (You can probably guess why you don’t want that near your eyes, although I must say that I used it twice daily for two weeks on my eye area without a problem.) I had already been using the eye cream on and off (if you type it into the search box you’ll see it pop up in videos posted nearly a year ago) but I had never used it ‘religiously’ and the challenge gave me the opportunity to test something out extensively. Results: I most definitely notice a visible difference around the eye area when I stop using the cream. It just looks…older. I’m by no means saying that StriVectin can rid you of your lines – you’d need the real Botox for that! (eek) – but this cream does smooth out the skin, keeping it hydrated and bright. 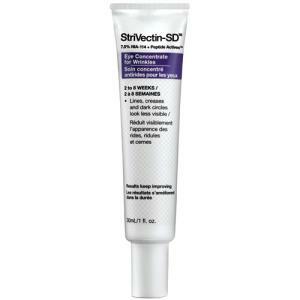 I’m now on StriVectin-SD Eye Concentrate #2, and almost out of that one. It’s one of those products that make you semi-panic when you start to run out! It costs £49, but you get 30ml, so twice the amount that’s in a standard eye cream. So, for the sake of comparison, it’s about £25 – not at all bad, in my opinion. You can find it at Space NK.